Traditionally this Shanghai casserole dish featuring oversized pork meatballs and greens is made with pork fat and cooked in a sand clay pot. The large meatballs are meant to represent a lion, and the shredded greens its mane. If you like, instead of 4 large meatballs you can form the pork into 6 - 8 smaller meatballs. Wash and drain the bok choy or other greens. Cut crosswise into 3-inch strips. Mince the ginger and green onion. In a small bowl, beat the egg with a fork. In a medium bowl, combine the ground pork with the green onion, ginger, salt, sugar, dry sherry, 1 tablespoon soy sauce, Asian sesame oil, pepper if using, and the egg, using your fingers to mix together the ingredients thoroughly. Add as much cornstarch as needed to make so that the mixture is not too wet. (I start with 2 tablespoons and then add 1 teaspoon at a time). Form the ground pork into 4 large meatballs. Flatten them a bit so that they are not completely round. Heat 2 tablespoons oil in a skillet or wok over medium-high heat. When the oil is hot, add the 4 meatballs. Cook for 5 minutes until browned on the bottom. Turn and cook the other side (adjust the heat if the meatballs are cooking too quickly). In a flameproof casserole dish or saucepan that is large enough to hold the meatballs, heat the chicken broth and 2 tablespoons soy sauce to boiling. Add the meatballs, reduce the heat and simmer, covered, for 10 minutes. Add the bok choy. (You can arrange the bok choy on top of the meatballs so that it steams, or lay some right in the broth if there is room). Simmer for another 15 minutes or until the meatballs are cooked through and there is no pinkness in the middle. 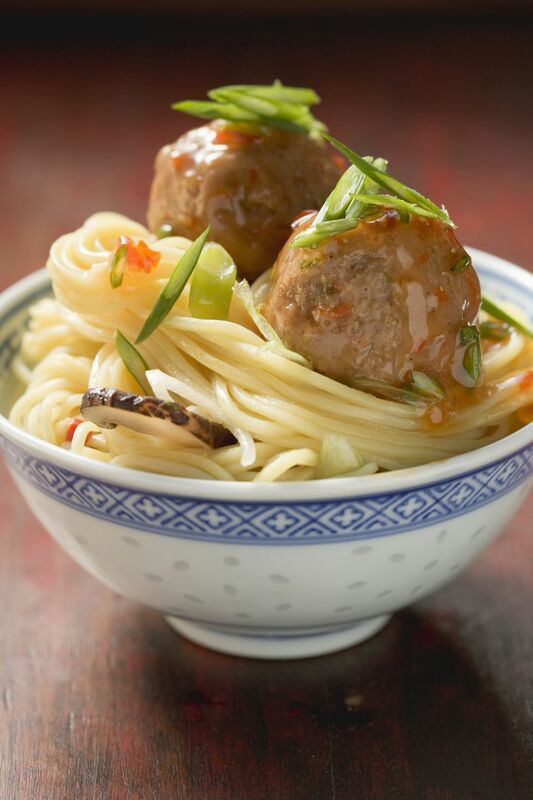 To serve Lion's head meatballs, serve each meatball on a small plate surrounding by the greens, or in soup bowls with some of the bok choy and broth. You can also thicken some of the broth with a cornstarch and water thickener and pour over the meatballs.